Equistro Azodine is a complementary feed supplement that contains high concentrations of electrolytes necessary to promote healthy muscle function. Equistro Azodine is a complementary feed supplement that contains high concentrations of Calcium, Sodium, and Chloride electrolytes, promoting healthy muscle function. 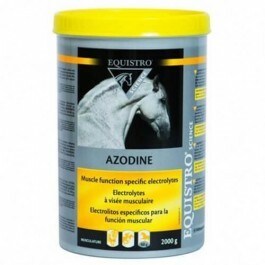 Equistro Azodine is particularly recommended for horses whose muscle electrolyte needs are elevated. Once a year, Equistro Azodine batch is analysed for environmental contaminant, ensuring that the product doesn’t contain ingredients likely to make a positive doping test. What are the benefits of using Equistro Azodine? Ideal for horses whose muscle electrolyte needs are elevated. What is in Equistro Azodine? How do I use Equistro Azodine? Horses (500 kg): 50 g (2 scoops) per day. Foals/ ponies: 25 g (1 scoop) per day. It is recommended to give for a 30 day period. To be mixed with the feed.